When my husband suggested that we raise chickens in our little backyard, I wasn't completely on board. I was worried it would be too hard. I knew nothing about chickens. As my boys got excited about the idea and I did more research, I realized that we could totally do this. My husband started making plans for building an amazing coop and the boys were eager to pick out their own chicks at the local farm and feed store. Darren, my husband, looked online and came up with a cool idea to turn a plastic bin into a brooder for raising our chicks. We researched which hens were good layers, tended to be calm and quiet, and were easiest to care for. We felt pretty prepared as we headed to pick out our chicks. The chicks in their homemade brooder. Our city's laws allow for eight hens and no roosters within city limits. I wanted three, Darren wanted eight, we ended up getting five. My boys and my niece, who was staying with us for a few months, each picked a chick they liked and my husband picked one out too. We ended up with five different breeds and we were excited to watch them grow. Holding a chick, so gently. And grow they did. Chickens grow FAST! Soon they were outgrowing their brooder and we didn't have their coop built. My niece and I cleared the area for the coop and my husband went into super builder mode. He built a fantastic coop and we moved our girls right in. Moving our chicks into their new home. A few weeks later, to our surprise, we realized that one of our girls...wasn't. Our Buff Orpington, was actually a rooster! We kept him until he got to crowing and then we had to take him back to the farm and feed store. We were sad to see Chirpy go, but the next spring we picked out two new chicks and hoped that we could introduce them together to the flock when they were a little bigger. Again we were surprised and took a rooster back to the farm and feed, adding only one to the flock. Chirpy, the Buff Orpington rooster, with Fluff, a Delaware, Lyrik, a Barred Rock, Pinky, a Rhode Island Red, and Patches, a Gold Laced Wyandotte. We ended up with five hens who were great layers. Over the years we've had one hen become ill and die, and we've acquired a hen from friends that needed to rehome her. 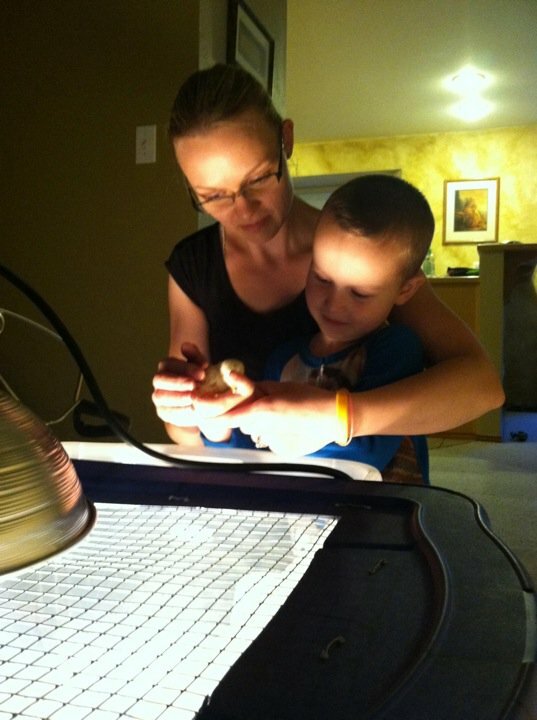 Anticipating some slowing down in the rate of egg production, we picked out three new baby chicks this spring. We still have eggs galore and five healthy hens, so we'll really be ready to share when our new babies start laying. Fresh eggs from our backyard chickens. If you are thinking about raising hens do your research. They do need caring for, but are quite independent if they have access to shelter, food, and water. We do have neighbors check in on them when we are out of town and collect the eggs. Cleaning up after them can be yucky, and caring for them if they are sick can be an interesting task. We have learned so much as we've raised hens of our own. I feel good about the eggs we eat and the lives that our hens live. They eat our kitchen scraps and we throw their manure and soiled bedding in our compost bins to create amazing fertilizer for our garden. My boys have learned responsibility and have enjoyed playing with the chickens, some of which follow them around like puppy dogs. There are so many benefits to raising hens. If you want pets that love you, are easy to care for, and that give you breakfast, chickens are for you. Do you have experience raising chickens? Share your tips and stories with us. Are you new to the idea of backyard chickens? Ask us your questions. What Is Your Environment Teaching? Examples and tips for getting the most out of your environment. The year we got so tired of struggling with our front lawn that we tore it all out was a life changing one. When we gave up grass, we gained so much more. We had chicks, but no chicken coop. My husband had decided to build one. It was going to be grand. My all time favorite salsa recipe. I always make a ton and I never make enough.